The success of most businesses depends upon the partnerships that are established with customers, employees, and suppliers. But the most important relationship is with that person whom you are with every day to make the business grow. I was raised in Bishop, Texas and moved to Corpus Christi after college to work with my father as a plant superintendent of a grain elevator. After 18 years in agriculture, I wanted to work for myself, so I started Campbell painting and construction. We did mostly residential painting and repairs. Then one day I went into a local paint store and I met a woman that would change my life. Her name is Irasema. She was born in Camargo Tamaulipas, Mexico and moved to Corpus Christi where she devoted her life to her family, especially her three children. But as the years passed, it became necessary to seek employment to support herself and her children. She went to work for Sherwin Williams Paint Company as a design coordinator. She worked there for five years. We knew that we wanted more than to be just husband and wife. We wanted to work side by side to build a business together. So after we were married, Irasema joined me in the painting business. We grew quickly. We went from 5 employees to 25. Sales increased by 400%. We went from a residential painting and construction company to doing large commercial remodeling projects. We even traveled to Virginia for seven months to completely remodel an Embassy Suites hotel. The painting business was very good to us, but we were getting older, and wanted something less demanding physically. My wife found an Asian restaurant that had been vacant for 2 years for sale. We knew absolutely nothing about the restaurant business. Neither of us had ever worked in a restaurant, much less owned one. We figured that it didn't matter how much of a load we had to carry in our red wagon. As long as we were both pushing, together, we could weather those days when everything seemed to be an uphill struggle. It took a year to remodel the building. Everything that could go wrong did. The things that we thought we could salvage from the existing building were worn out or too expensive to repair. Even the plumbing drain system was collapsed and had to be rerouted. We did the remodel ourselves to save money and to give ourselves time to learn more about the business. We decided to open as an upscale Mexican restaurant. We faux finished all of the walls, made use of the Asian chandeliers by adding some colored glass beads, covered the tables with tablecloths, selected linen napkins and added salsa and meringue music for background. It seemed like we were never going to open. We had contractor delays, problems with additional funding, and all of those other unforeseen obstacles. But we finally opened in November 2007 because we had too. We had been making mortgage payments for a year with no income. Debt was upon us, so we needed income. As soon as the doors were open we had business, and I mean a lot of business. It was unbelievable. My wife and I would wait until the end of the day to look at sales. We would hold hands and look at the computer together. We were in awe at what was happening. Today, almost 5 years from the decision to buy a restaurant, our cups runneth over. We have what we have because of the loyalty and support of our customers, our employees, and our suppliers. But the one person who helped us more than anyone else from day one is Victor Alvarado. He helped us with every aspect of startup. He helped design the menu, he sold us our computer system and helped train us, and he even worked in the kitchen when we needed help in the beginning. He still is helping us every day as our food service rep with US Foods. We will be forever grateful to him and all of the others who helped two people who just wouldn't be discouraged. But beyond all of this, nothing is more important than our family. All our five children Scott, Marchee, Clay, Joshua, and Chante have been so good to us to work when we needed help. When they are here, we know that the business is well taken care of. So that's our story. All we did was partner with each other. We made a commitment to each other that we would push that red wagon uphill everyday if necessary. We never gave up and we never will. We remain grateful for whatever happens, for we know that He is guiding us. 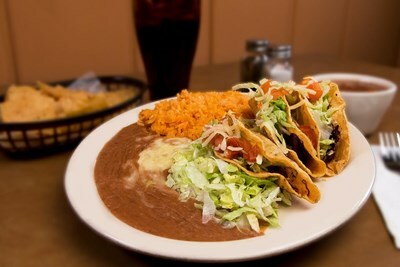 Come see us at Senor Jaime's Mexican Restaurant where . . . Every Day is a Good Day!